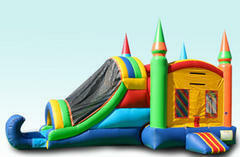 This combination bounce house has a jump area, so that your guests can freely bounce around. Furthermore, it has a climbing area, so that guests can reach the top slides. Those very two slides are inflatable, and a wild rush to tumble down! If you feel sporty, try our basketball hoop. Score a goal and order this product for your party today. If youa re rentimg at a park you will need to add a generator and this unit can only be rented dry. The set up area for this combo is 38L X 20W X17H.